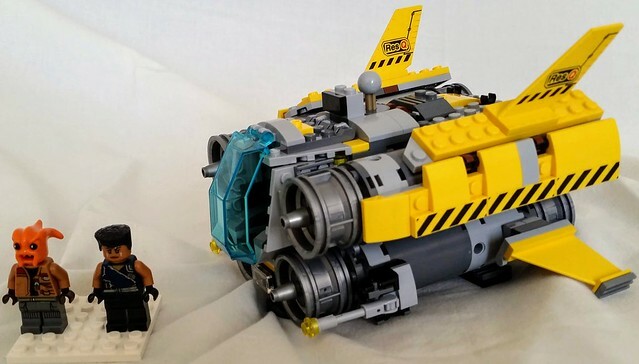 This smaller space freighter is meant to get smaller, yet very dense loads through heavy planetary blockades without being noticed due to shape-and-trajectory-jamming technology and four experimental high speed engines that can let them outrun all but one of the ships in the Space Police IV armory. The name of this extraordinary vessel is the RES-Q and was built by Jack Stone Industries as a one off before they were absorbed into Octan Corporation. Mr. Stone himself destroyed the plans and took the ship and a bunch of spare parts to a hidden asteroid at great personal risk (he was killed by Lord Business for this later on), where it was picked by it's current pilot and crew who then joined the Resistance against the Space Police IV. 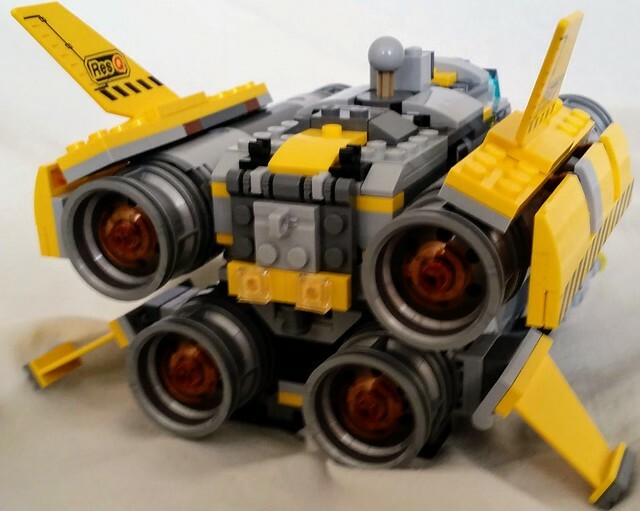 The ship features two laser guns near the lower engines, (in trans yellow, on the light bluish gray bars) and two large fins with RES-Q printed on them from the ill-fated Jack Stone theme. The rear of the ship and the four huge engines. This section also has the hidden cargo compartment, which is accessible via the folding roof section. The name of the alien figure of the left is Kranxx. In the almost ten years since the fall of the Black Hole Gang he has put his organizing and secret-gathering skills to better use now that he is a part of the resistance against the outright corrupt Space Police IV. He runs the blockade runner space freighter RES-Q alongside his pilot Valkyrie or "V" as she is known informally by the group. 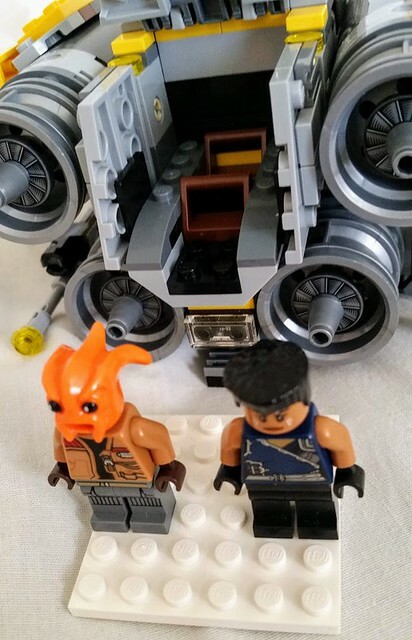 Valkyrie (on the right) is from the Marvel Universe and was sent to the LEGO Universe on accident by the Bifrost. She was found floating in space by Kranxx, and he helped her to learn about her new home in a strange and unfamiliar universe. As a pilot, her skills are unmatched by any organic, non-augmented being found so far. "V", as she likes to be called, also has started to have feelings for Kranxx.... though it remains to be seen if he returns the affections! 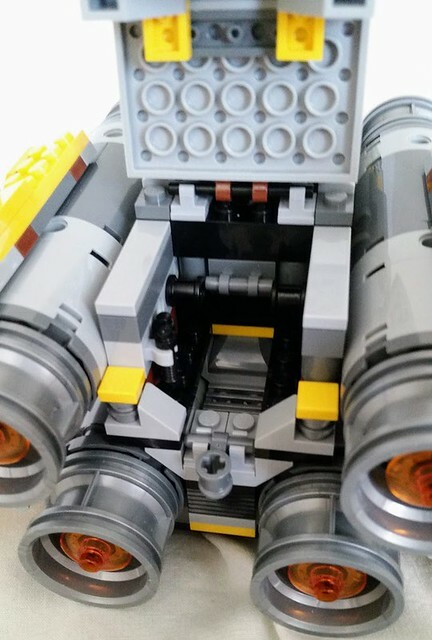 In reality, this is a modification of set 75178. 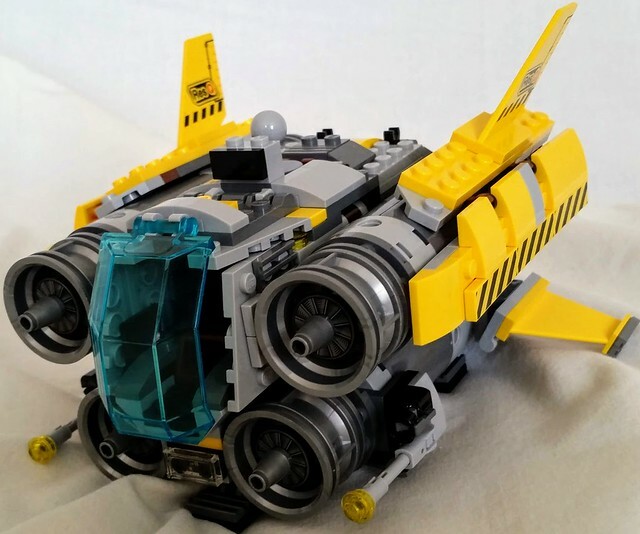 (Jakuu Quadjumper) I removed the exploding engines feature, added yellow parts instead of the regular dark orange, and changed the main windscreen to trans-light blue. The figures are a mix of Star Wars, Space Police III, and Marvel. Comments, Question, Complains, and suggestions, are always welcome!